Funeral services honoring the life of Mary will begin with visitation at 9:00 a.m. until 10:30 a.m. on Monday, April 1, 2019 at St. Mark Catholic Church, 7117 14th Avenue. A Mass of Christian Burial will be celebrated at 11:00 a.m. at the church. Entombment at All Saints Mausoleum will follow. A visitation for Mary will be held on Sunday, March 31st from 3:00 p.m. until 6:00 p.m. at Piasecki-Althaus Funeral Home, 3720 39th Avenue, Kenosha, WI. Memorials in honor of Mary may be directed to Hospice Alliance, Inc., 10220 Prairie Ridge Blvd., Pleasant Prairie, WI 53158, St. Joseph Catholic Academy, 2401 69th Street, Kenosha, WI 53143; St. Norbert’s College, 100 Grant St., De Pere, WI 54115 or St. Mark Catholic Church. 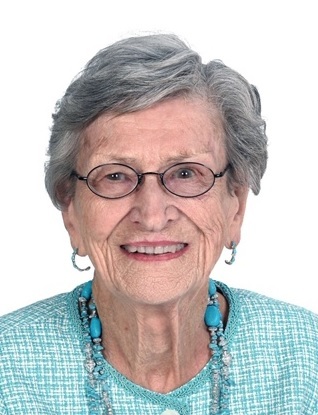 Mary Lenore (Younglove) Johnson age 97 of Kenosha passed away peacefully on Wednesday, March 27, 2019 at her residence surrounded by her loving family. Born September 18, 1921 in Berlin, Wisconsin; Mary was the daughter of Dr. John Ardin and Mary Louise (Comer) Younglove. She graduated from Berlin High School in 1939 and from Lawrence University in Appleton, Wisconsin, in 1943, with a B.A. Degree in English and Secondary Education. She taught at Hartford High School, Hartford, Wisconsin, and was a substitute teacher in Baltimore, Maryland and Kenosha, Wisconsin, retiring in 1971. For eight years, she taught religious education at St. Mark Catholic Church. On September 27, 1945, she married Donald Joseph Johnson at St. Joseph Catholic Church rectory in Berlin. WI. He preceded her in death on January 13, 1993. During her life, she had been a member of many organizations, both civic and religious: Jr. Clubwomen of Drexel Hill and St. Dorothy’s Church in Drexel Hill, Pennsylvania, Glendale Woman’s Club, and Immaculate Heart of Mary Church in Baltimore, Maryland, Egg Harbor Country Gardeners’ Garden Club, Door County Hospital Auxiliary, St. John the Baptist Church, and Egg Harbor Board of Appeals in Egg Harbor, Wisconsin. In Kenosha, she was a past member of Kenosha Jr. Women’s Club, Kenosha College Club of A.A.U.W., School Board of St. Joseph High School, St. Catherine’s Hospital Auxiliary, Kenosha Public Museum, Kenosha County Historical Society and served two terms on the St. Norbert College Board of Trustees, De Pere, Wisconsin, retiring as a Trustee Emeritus. She held offices in Jr. Women’s Club, St. Catherine’s Hospital Women’s Health Center, St. Mark’s and St. Joseph High School’s Home and School Associations. She had served on the first Parish Council at St. Mark’s Church and wrote and directed several music and variety shows for fund raising, as well as serving as a den mother for Cub Scouts and an assistant Girl Scout Leader. She was a member of St. Mark’s Church and served as an Eucharistic Minister. For many years, she was a member of the St. Joseph High School Endowment Foundation, Inc. Board. Surviving are three children, two sons; Jeffery D. (Ruth) Johnson of Egg Harbor, WI and Gregory D. (Kathleen) Johnson of Kenosha, and one daughter, Sara C. (Paul) Tutskey, De Pere, WI, one sister; Joan S. Hansen of Mequon, WI, six grandchildren; Jessica (Dan) Bauer, Heather (Nicholas) Shaffer, Amber Johnson, Lynn (Zach) Garcia, Lisa (Cory) Schubring and Eric (Maria) Tutskey, 15 great-grandchildren, 1 great-great grandchild with the second on the way. In addition to her husband, she was preceded in death by her parents, step-mother, Emma G. (Henderson) Younglove, and a sister, M. Louise Mittnacht.